I witnessed and was at times the victim of black propaganda campaigns when I was a foreign correspondent. False accusations are made anonymously and then amplified by a compliant press. The anonymous site PropOrNot, replicating this tactic, in 2016 published a blacklist of 199 sites that it alleged, with no evidence, “reliably echo Russian propaganda.” More than half of those sites were far-right, conspiracy-driven ones. But about 20 of the sites were progressive, anti-war and left-wing. They included AlterNet, Black Agenda Report, Democracy Now!, Naked Capitalism, Truthdig, Truthout, CounterPunch and the World Socialist Web Site. 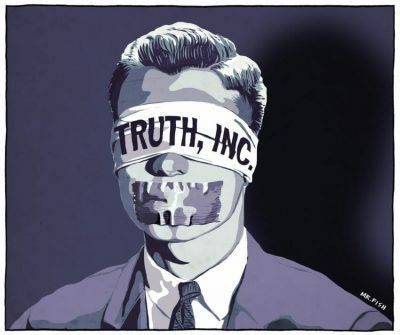 The corporate oligarchs, lacking a valid response to the discrediting of their policies of economic pillage and endless war, have turned to the blunt instrument of censorship and to a new version of red baiting. They do not intend to institute reforms or restore an open society. They do not intend to address the social inequality behind the political insurgencies in the two major political parties and the hatred of the corporate state that spans the political spectrum. They intend to impose a cone of silence and the state-sanctioned uniformity of opinion that characterizes all totalitarian regimes. This is what the use of FARA, the imposition of algorithms and the attempt to blame Trump’s election on Russian interference is about. Critics and investigative journalists who expose the inner workings of corporate power are branded enemies of the state in the service of a foreign power. The corporate-controlled media, meanwhile, presents the salacious, the trivial and the absurd as news while fanning the obsession over Russia. This is one of the most ominous moments in American history. The complicity in this witch hunt by self-identified liberal organizations, including The New York Times and MSNBC, will come back to haunt them. When the voices for truth are erased, they will be next.